Reviewing a board game about a military action that took place just 11 years ago imposes at least a few obligations on the reviewer. One is whether or not the game is enjoyable, mechanically sound and challenging regardless of realism. That’s the expectation for any game, in any time period, in any genre. That’s the easy one. 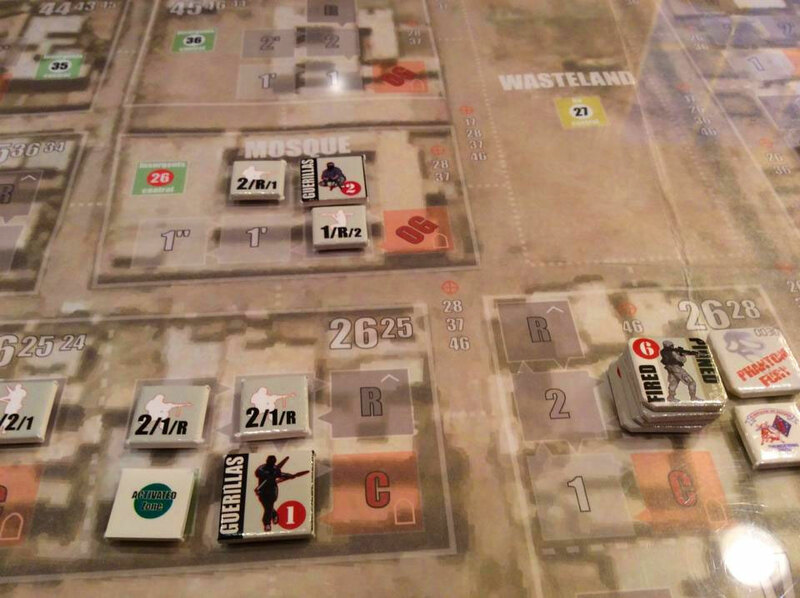 Two is whether or not the game truly models the squad tactics of a contemporary marine squad. 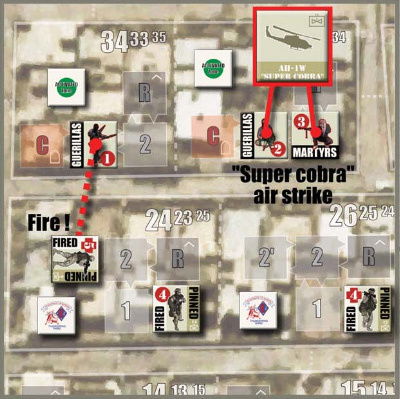 Do the decision points in the game and the results that are subsequently modeled, reflect the reality of modern, urban combat operations, at least from a tactical or strategic standpoint? In that assessment, I must defer. I can’t speak to the realism of a game such as this, aside from banal comparisons to movies I’ve seen and media I’ve read. If anyone has a military background — the kind that has you clearing hostile neighborhoods, room to room, house to house, and block to block — please get in touch with me if you’ve played this game. Part of me can’t imagine anyone who has experienced the events depicted in this game would ever seek out Phantom Fury. But if such a person exists, and he or she is within eyeshot of these words, I would like to hear your thoughts on how this game models (or fails at modeling) combat in the field. I will gladly share your views with my readers, and provide this missing perspective. With that said, I do believe the designer did his due diligence in bringing a realistic portrayal of the conflict, insofar as Laurent Closier’s designer notes and excerpts from the USMC Gazette article imply. 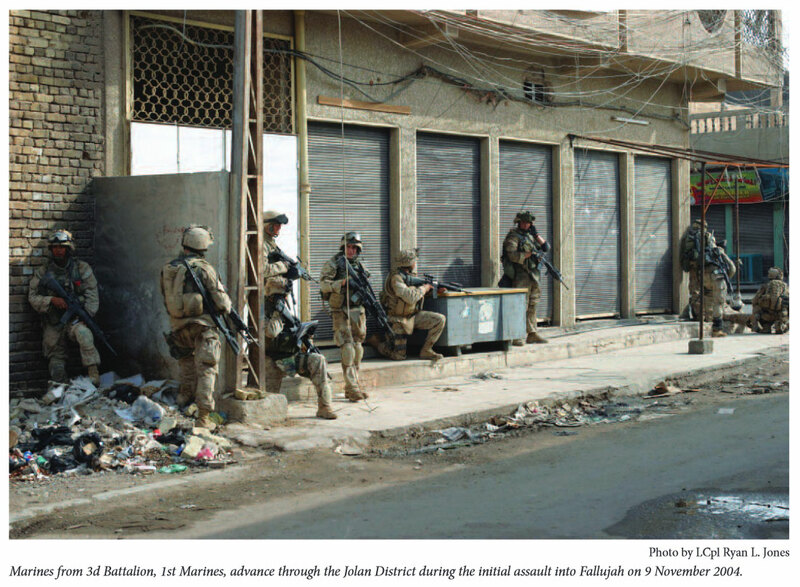 The article is titled, “Infantry Squad Tactics, Some of the lessons learned during MOUT (military operations on urbanized terrain) in the battle for Faullujah.” Closier relies heavily on this resource, along with a few others on the topic. The paper game board is comprised of zones, and the zones are comprised of buildings. The buildings themselves contain rooms at various elevations. For example, a building will always have a courtyard at street level, one or two first-floor rooms, one or two second-floor rooms and a roof. Between and among these zones and buildings are streets. One look at this map, and it’s easy to see how the layout presents plenty of tactical challenges. Considering lines of sight and the best routes on which to advance will leave you pleasantly engaged. You begin the game at the bottom edge of the play area by first randomly drawing nine starting USMC units. The remainder are ceded to your company and battalion reinforcement pools. All the marines are two-step units, with starting combat values of 4-6. When flipped, they lose one point. A second hit eliminates the unit. You’ll be praying that the “4” combat units are sparse or non-existent in your initial assault force. 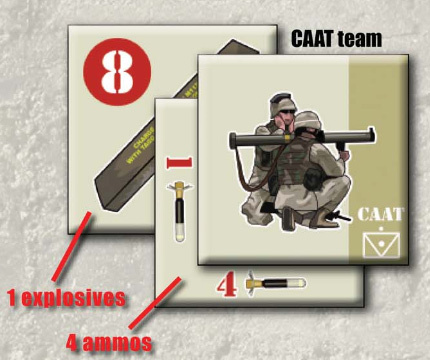 Thankfully, the marines begin with four CIAAT’s (Combined Anti-Armor Teams) that give select units (your choice) extra firepower — albeit limited to four uses each — and a one-use Explosives asset. The extra firepower that this support brings is invaluable to your teams, and you will wish many times over that you had more. It’s an enjoyable exercise simply trying to figure out whether to buff up you 4-strength units with CIAAT’s or overpowering your 6-strength units. USMC units also have two M1A1 Abrams units are their disposal. These provide extraordinary firepower and mitigate against damaging sniper attacks during infantry street crossings. It’s always good to have an M1A1 Abrams around, but with just two of them to support nine or more Marine units, you will have some hard decisions to make during the course of the campaign. In a nutshell, Insurgents flee via egress routes when attacks fail against them (marked on the board by location) so you have the pleasure of meeting them again later. Martyrs hold firm. They’re not going anywhere. Ever. You will learn to fear the Martyrs, and you will often find yourself burning through your CIAAT assets to rid yourself of the headache and to keep pace with flanking Marine units that may be advancing ahead. In the end, Martyrs will often slow your units’ advances and will sometimes lock a unit in place for two or more turns. They are imbeciles! Martyr and Insurgents have combat values ranging between 1-4 points. 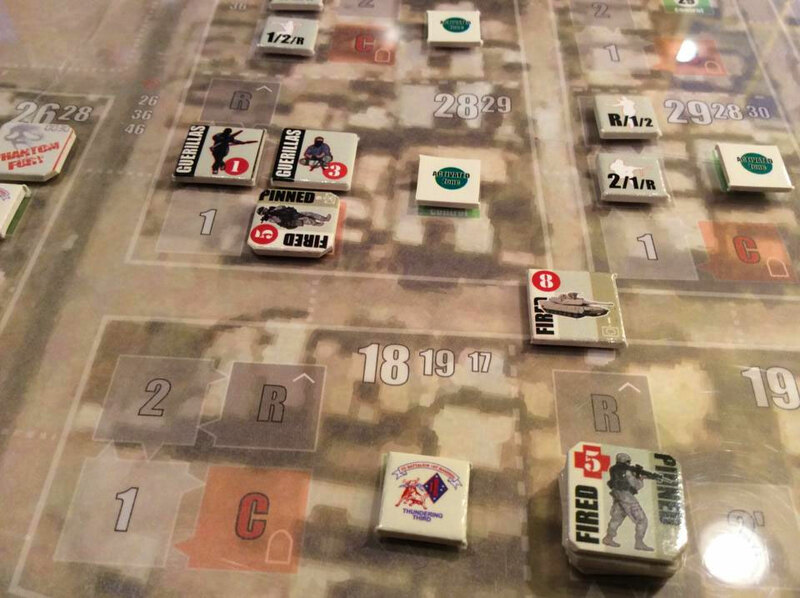 You’re dealing with a big board, so to keep setup at a minimum and keep variation at a premium, the game uses suspect markers in locations where the enemy is currently unknown. When a marine unit enters a location, you roll on a table to determine whether an existing suspect marker is a “dummy,” insurgent or a dreaded Improvised Explosive Device (IED). Suspect markers are also revealed when fired upon. In fact, as soon as any counter is assaulted (adjacent) or fired upon (ranged), all the markers in the building are revealed. The likelihood of martyr units appearing increases if the area is fortified, and the number of fortified areas used in the game is how you scale the game from easy to difficult. As anyone who has followed the modern military and its capabilities, you know that the USMC has more at its disposal in a war zone than boots on the ground. I’ve already mentioned the tanks. In addition to these assets, you have the ability to call (for a limited number of times each per game) three powerful, high tech options. The first of these is the UAV’s (Unmanned Aerial Vehicles), or “Dragon Eye.” This is how you can survey a pair of zones to determine the extent of the enemy’s presence. You get up to four of these missions per game. Another is the “Super Cobra” (AH-1W). Select two targets within an insurgent-controlled zone, and they are toast. You get two of these missions per game. Finally you can call up a “Hornet” close air support once per game. The Hornet levels an entire zone, killing all insurgents or suspect markers. While these three support options may seem plentiful and powerful, they are not guaranteed when you request them, and when you fail, the insurgents get a “bonus round” of sorts. So when the insurgents have time on their hands, expect them to reinforce, launch counter-attacks, retreat (which means you’ll have more to fight later, so don’t get too excited) or orchestrate an IED attack. The combat in Phantom Fury is straightforward. 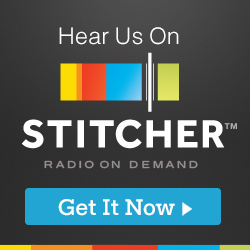 The basic premise is rolling your combat strength or lower on a d10, plus or minus modifiers. As modern tactics dictate that top-down “flooding” assaults are preferred when clearing out a building, getting to the rooftops is paramount. You not only get a positive die roll modifier when attacking from a higher level to a lower level, but you have the potential of clearing an entire building out in one turn if the dice are good to you. Hence, you “flood” the building with your awesomeness. On the other hand, a bottom-up assault can be a slog with negative modifiers and stalled progress even with a successful attack. There are a number of nice details in Phantom Fury that breath life into the game and elevate it to something special. 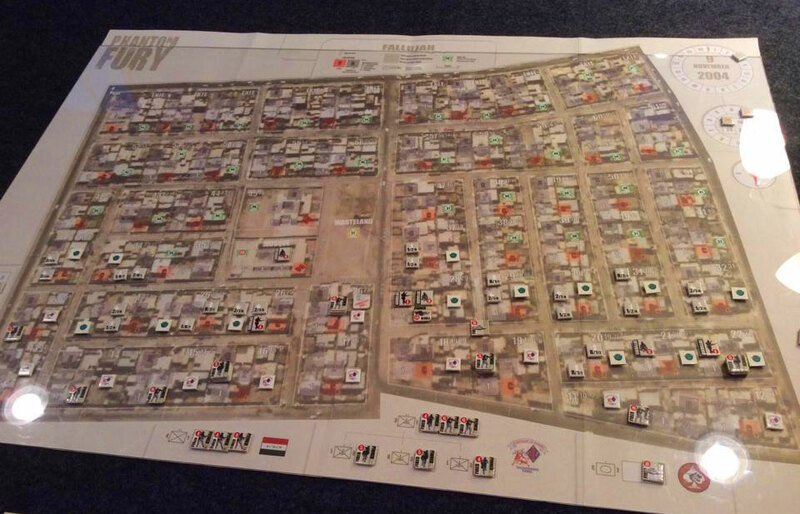 For instance, true to history, the mosque in the lower portion of the board is an objective, but only Iraqi troops are allowed to enter it. They can enter the map when the Mosque is within sight. The Mosque is an objective in the game, and it can be a tough fight when this location is off limits to the much better trained marines. Another detail is that each marine unit can detach a security element when entering a building. At the expense of a temporarily lowered combat factor, the presence of a security element insures that gorilla units don’t run away to fight another day. I found the use of these security elements a tough sell, as the primary unit suffers a lowered combat factor. Your combat effectiveness is instantly reduced by 10 percent. I’m still playing around with the overall advantages/disadvantages of using security elements, and I probably ought to use them more. Combat itself introduces some additional thematic elements. During an assault (an adjacent attack), a roll of “0” on the die means it’s time to consult the Random Events Table. In the case of marine events, you might get the benefit of a sniper attack or a hero is added to the unit, improving future attack rolls. There are others. The insurgent events can result in battlefield horrors such as a suicide bomber (the worst! ), fanaticism (it’s as bad as it sounds) or drugged fighters (it’s harder to displace the stoners). Like most games, there is a time element and a victory point element to gauge the player’s success or failure. You have 16 turns to bring all zones — including the mosque — on the map under marine control. That alone is a tough nut to crack. Meanwhile you’ll lose victory points for marine step losses and gain them for gorilla units destroyed. Forget about getting points for martyrs. These demoralizing jerks are hell bent on dying anyways, so they are worth nothing in terms of points. You’ll also lose points when gorillas leave the map. The game conspires against you in this regard, as egress routes are always in the general direction of the top board edge. If retreats get out of hand, you’ll have increasingly more insurgents to fight as the game goes on, and the likelihood of victory point losses for enemies leaving the map increases. In the end, if you manage to secure all the zones, you at least win a “Bitter Victory,” but if you can bring your victory points into the positive column (a tall order), you will win a minor victory (0-10) or major one (10+). 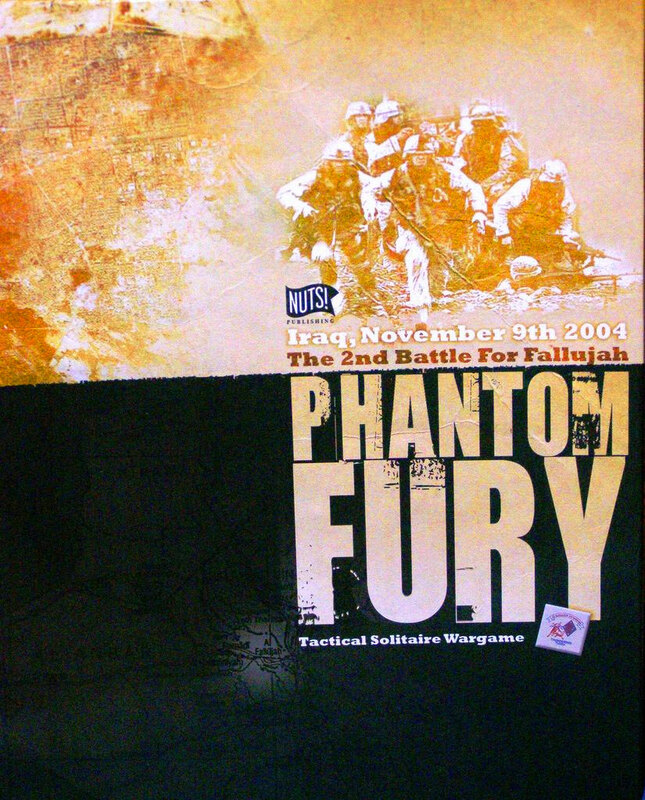 I found Phantom Fury to be an exceptional solitaire wargame. There is plenty of variety in setup, distribution of assets, the uncertainty of support missions, and enemy activation to make each game a unique challenge. Combat is tense. With each die roll you will fear failure and step losses. Losing a step can be crippling, especially in the case of a 4-strength marine who becomes a 3-strength marine. There is little hope of continued success (or at least forward momentum) with these units, and you’ll tend to keep them back for ranged fire. The constant threat of freak accidents (IED’s and Suicide Bombers) also keep you on the edge of your seat and will at times leave you demoralized as you try to regroup and recover from these sudden losses. Pinned units will also leave you scrambling. If you don’t push your other marines farther you risk a quagmire, but pinned units flanked by advancing marines run the risk of enemy infiltration (insurgents retaking secure rear areas) if you’re not careful with your front line. Phantom Fury is tense, tactical, immersive and exciting all at once. In the somewhat sparse arena of truly solitaire wargames, this is an entry worthy of your undivided attention. I know a solid wargamer who was there. But he won’t play this game. Said that it was all still too close to game. Yeah, I can’t imagine he would jump into this, Kev. Totally understandable.